Aha. I have just realised that there is a good way to overcome some of the disadvantage that pertains to car shows -the thing that I complained about in a previous column; the overcrowding of the display lines. I’m not a greedy person – I don’t want it all for myself or all to myself …but I do wish for a clean view of it. Now I think I have it. I noted a similar opportunity last year at the end of the Australia Day car show in Melbourne. There were a number of roads exiting the main park and moving down them was slow for the drivers of the veteran and vintage cars. All the better for the photographer. In the future I am going to bide my time – perhaps even go a little later in the day – and mark well the exit roads and possible vantage points. I’ll still try to get close-up detail for cars as well as lurching crowds will permit but the best clear shot will be as they drive away. Photographer’s note – tempting as it is to use a tripod for this, I still think a hand-held camera and a fill flash will be best. I’ll be using the pre-focus manual method with everything set as the cars approach a fixed point. It’s always a little experimental as to when to release the shutter when you are using an electronic view finder – there is a time lag in any camera. If you have set the speed, aperture, and manual focus, however, you can sight along the top of the camera housing and fire it instantly when the vehicle comes to your pre-selected point. This also works with 17 pounder anti-tank guns but it is more difficult to use them unnoticed – at least with the Fujifilm cameras you can turn the shutter noise off. Technical note: These images were taken using the new Fujifilm X-T10 and the 27mm f:2.8 pancake lens. What a sweetie of a combination – light and fast. Perfect for touristing it without weight or bulk. Next best will be the new 35mm f:2 when it is released in Australia. Ye Gods, How Did That Get There? I believe that there must be a lack of mirrors in the houses of Perth. Perhaps there was a drought on the mirror farms – it might have been a general government ban – perhaps midnight thieves have removed all the mirrors…whatever, the effect has been to deny men, women, and young people the chance to look at their appearance before they leave their houses. Before they venture out in the street – before it is too late. Today, as far as the general dress of the show-goers…it was too late. I have been rinsing my eyes with boracic acid and patting them dry with cotton wool and hope to be recovered enough to venture out again tomorrow. I am contemplating a reverse burqa – everything open except the eyes. 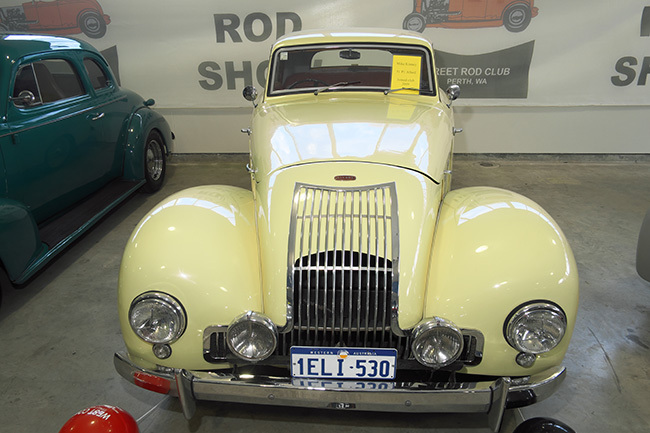 Moving onward from this, here are three pictures of something that startled me today -an Allard motor car. 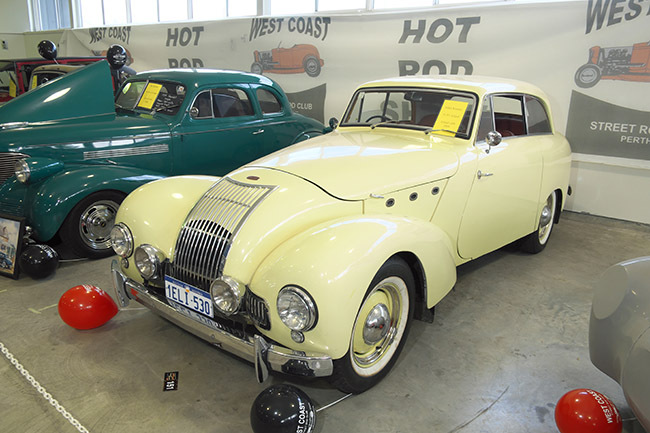 It startles me because it is an Allard, it is in Western Australia, and it is in a hot rod show. I would have thought the bird rare enough in its native land – the United States – and so far back in time – the 1950’s – as to preclude ever being seen elsewhere. Perhaps there was enough mining or pastoral money accumulated to import it. Or perhaps it was just spores that drifted in on the wind – whichever it was, I am delighted to see the beast. Unfortunately behind a barrier, and unattended, but I hope to do more research – it is a marvellously blended style – reminiscent of someone’s memory of pre-war art deco streamline styling. Please note the suicide doors provided for scooping up cyclists in the back streets of Nedlands after dark. The portholes are too small to be functional but do act as punctuation marks for the marvellous bonnet line. I look in consternation at the provision of a marvellous grille covering a small bonnet opening and wonder if it is a mis-alliance of two designs. Likewise the marriage of a sweeping French front end with a pedestrian British back end. 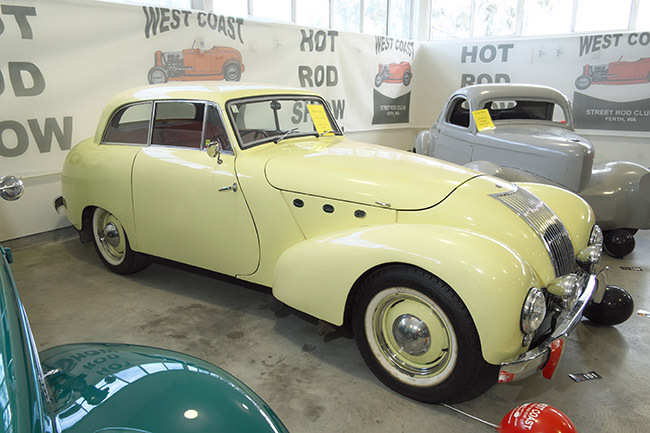 This odd jointure is not exclusive to Allard – we can see it time and time again in other designs – almost as if two teams worked on a body shell and were compelled to weld their ideas at about the front pillar line.